I don’t usually give training advice in this blog. I’ve been writing about my adventures for years now, but I shy away from sharing techniques or how-to's. I rarely feel like I have the authority to advise others. I might explain why I train a certain way, but avoid the details of how. My last post sparked a debate on Facebook, which I was afraid of and also didn’t really expect from this particular topic. I was honestly surprised to hear how problematic it could be for some teams. 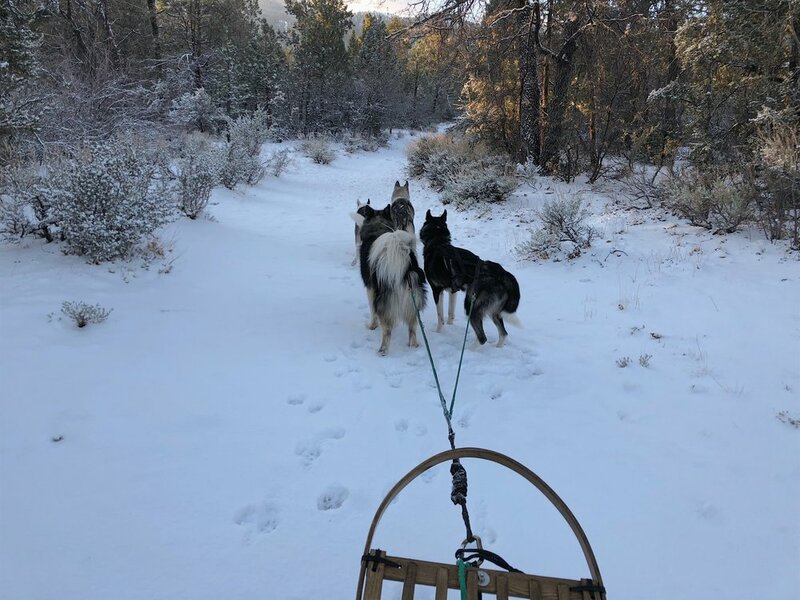 It’s good to take in others’ experiences, though, and I don’t want to do the mushing world a disservice by implying my way is the only right way. When it comes to using the come-haw/come-gee commands, there are two things I forgot to mention: first, your dogs need to know how to stop (“whoa”) before initiating the turn, and second, be aware of tangles. Tangled lines can be a very real danger for a dog team of any size. Mushers should always carry a knife to free a tangled dog (in worst case scenarios). On our first local run in California, after I had used come-haw a few times, I unhooked my wheel dogs’ neck lines as a precaution. It should be made clear that what works for me may not work for a team of 14-dogs running through the Alaskan wilderness or a single-dog scooter running through Central Park. I’m experienced in running a small team (four dogs) on narrow, hilly trails—often used by mountain bikes, hikers, loose dogs, or even shared by vehicles. For much of our history, we’ve been a “sprint” team (if you’re looking for an industry term) and rarely run more than 10 miles at a time. As my team grows to five and hopefully six dogs, I do want to move towards mid-distance running, but that requires a lot of other considerations for us. I’m not a competitive sled dog racer. In the eight years I’ve been running dogs, I’ve competed in less than a dozen races—and only a few of them sanctioned. If you’re looking for advice to apply during races, this may not be the place. I run to keep my dogs happy and healthy, and because I love the bond we share when we’re out in the woods working together. When I do compete, it’s usually to help support the clubs I’ve joined. I’ll be the first to admit I don’t know everything about mushing. Hell, I still buy lines rather than learn how to use a fid (it’s a goal for this year, I swear). But I have been shaping my life around this hobby. I joined clubs and found mentors before I got my first husky. I’ve read books and watched documentaries. I’ve followed dozens of other mushers via blogs and social media, gaining insight from their successes and failures. I’ve been lucky enough to attend races and trade fairs where experienced mushers have lectured and shared stories. I have incredible breeders just a DM away to answer questions or share their knowledge. I’m a researcher by nature and a project manager by trade, so I’m constantly looking to optimize and improve all aspects of my life. And most of my life revolves around these dogs. I don't mean to sound defensive or combative with this discussion. I just want to offer an explanation and a bit of insight for those who read this blog. Take all internet advice with a grain of salt and use your head when applying training methods to your own team. I can only share my own perspectives here and hope that it helps others in their adventures.